Heat and humidity: those are the two words that come to mind when trying to describe summers in Maryland. But those of us who live in this fine state know how to beat the heat. We don’t let a little muggy weather ruin our summer plans. Oh no! Come the weekend, it’s all crab feasts and pool parties. Marylanders everywhere will throw down some old copies of the Baltimore Sun, dust off those crab mallets, and dive into a nice, big pile of steamed crabs. Yum! So how do we do it? Shade! When it comes to beating the heat, nothing beats the classics. Shade is still the best way to stay cool and enjoy the great outdoors. And while you could add an awning over your deck or patio, nothing will provide the shade you need and the curb appeal you love quite like a pergola. Shade: In its most simple form a pergola will create dappled shade. Aesthetic Appeal: A pergola can easily create a visually attractive backyard feature that will leave your neighbors envious. Cost Effective: Pergolas are fairly simple and inexpensive to build. Maintenance: If you choose to go vinyl, maintenance is quick and easy. All you need to do is to wash them down once or twice a year with soap and water. Home Value: Adding a pergola will also help increase home value. It’s time to start enjoying your backyard Just think – no more baking in the hot summer sun. Aaaaah! 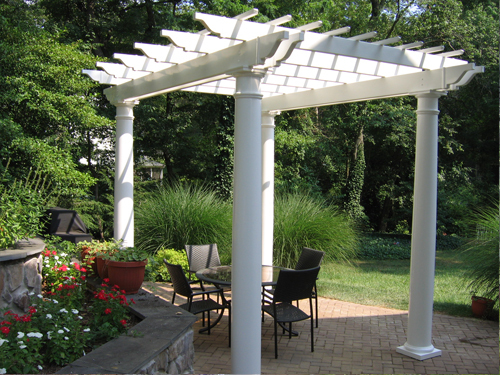 A pergola can help transform your yard into the backyard oasis you have always dreamed of. Mid Atlantic Deck and Fence offers a wide variety of pagodas, gazebos, and pergolas. We have been building and installing pergolas for our customers for several years. Please take a minute to review some of our completed projects. And now, we also offer our beautiful vinyl pergolas in kit form, allowing you to cut out the middle man and handle construction on your own. If you have any questions about the benefits of Pergolas in Maryland, please contact Mid Atlantic Deck & Fence (MAD Fence) today by clicking here or calling 1-800-833-9310. You can also follow us on Facebook and Twitter as well.